This is my overview of the second day of the EGSR conference, which took place from 27-29th of June, in Paris, France. For a list of authors, and download links of all papers presented, I refer to Ke-Sen Huang’s excellent page. Another great EGSR overview can be found here. Edit: Thanks to Stephen Hill from Ubisoft Montreal for pointing out some typos! If you missed them, have a look at my overview of day 1 an day 3 too. The second day started out with the Global Illumination papers. Pre-convolved Radiance Caching is a technique which tries to enhance Irradiance caching (which caches scalar values) and Radiance Caching (which caches directional information in spherical harmonics). This paper proposed to do a pre-filtering based on MIP-map, so the time to calculate each pixel reduces to a constant-time lookup. The lookup is normal/BRDF-dependent, and the mipmaps cause a typical 1/3 memory requirement increase. The main contribution of this paper is that it generates results which are visually similar to what can be obtained with Radiance Caching, at a computation cost more similar to Irradiance Caching (simple interpolation of scalar light). The next paper was Quantized Point-Based Global Illumination, which offers a method to reduce memory footprint in PBGI by factorizing the data over the tree-node, using k-means clustering. By doing this, they can reach compression rates ranging from 3x to 5x for the entire tree. The definition of representative nodes in the octree and re-using them in PBGI ‘cuts’ leads to a result which is perceptually and numerically very close to the ground truth (generated with a full PBGI tree). The last Global Illumination paper, Progressive Virtual Beam Lights, offered an impressive technique which builds on previously presented ‘ray lights’. In the context of indirect transport paths in, from and to media (fog, …), these ray lights are inflated to beam lights with finite thickness to eliminate singularities. The algorithm can be seen as an explicit final gather over progressive photon beams, giving an impressive way to render surface-to-media and other lighting transports. After the break, it was time for the Image Analysis and Editing papers. 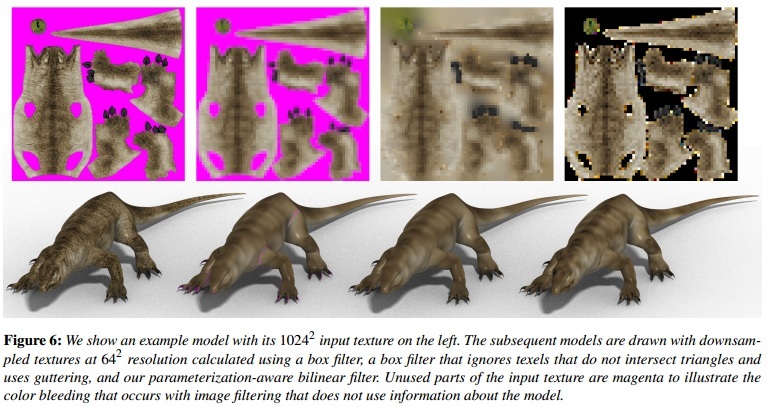 The first paper, Intrinsic Images By Clustering (no link available at the time of writing), proposed a method to decompose one given image into its shading and reflectance components by clustering, without user input, which I thought worked quite well – interesting subject, I hadn’t heard about this part of image-based methods before. Artistic Illumination Transfer for Portraits and Matting and Compositing for Fresnel Reflection on Wavy Surfaces (no link available at the time of writing) both offered interesting results, but I found their applicability somewhat limited. After the lunch break, it was time for the papers on Geometry. 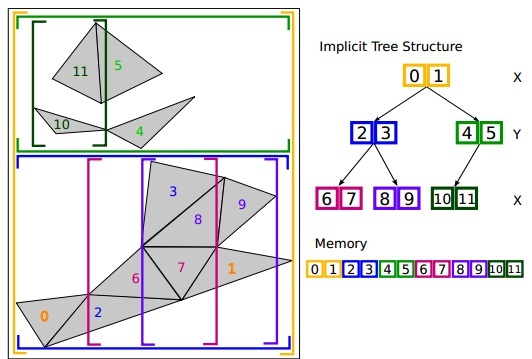 First one was Geometry Presorting for Implicit Object Space Partitioning, which presented a new data structure for object space partitioning that can be represented implicitly – so no explicit bounding volumes or BSP/BVH-trees, which of course lowers implementation complexity. By sorting the geometry in a special way, they can locate the bounding planes of any node on the fly using only a specific subset of all faces. This approach is very interesting for situations where memory limitations are an issue. The second paper was one of the most impressive papers on EGSR, in my humble opinion. Parametrization-Aware Mip-Mapping explains how, by generating mipmaps slightly differently, one can take into account the distortions due to the parametrization of the surface. By correctly downsampling textures using weights for every texel, depicting how much area it covers on a model’s surface, one can get a better final result on the model with applied texture. The method only requires a change in MIPmap generation – the rest of the rasterization process stays the same! The last paper in this section was Tesselation-Independent Smooth Shadow Boundaries, which offered a solution for rendering shadow boundaries that do not revel the tessellation of the (possibly tesselated) shadow-casting geometry. The algorithm does silhouette reconstructing using the vertex normals of the original mesh. This all happens in the context of shadow volumes, which is an alternative method to rasterizing shadows using a regular shadow mapping technique. The method decouples the shadow smoothness from the geometry tesselation, and works on multiple LOD levels. After the break, the last section of the day was Non-Photorealistic Rendering. In A Stylized Approach for Pencil Drawing from Photographs, an algorithm was introduced which can handle a wide array of art-like drawing styles. The paper Surface Relief Analysis for Illustrative Shading introduced several shading techniques which can be used in the field of cultural heritage/archeology studies. The day ended with the EGSR Social Event: dinner on a boat (a ‘Bateaux Mouche‘, ‘fly boat’). 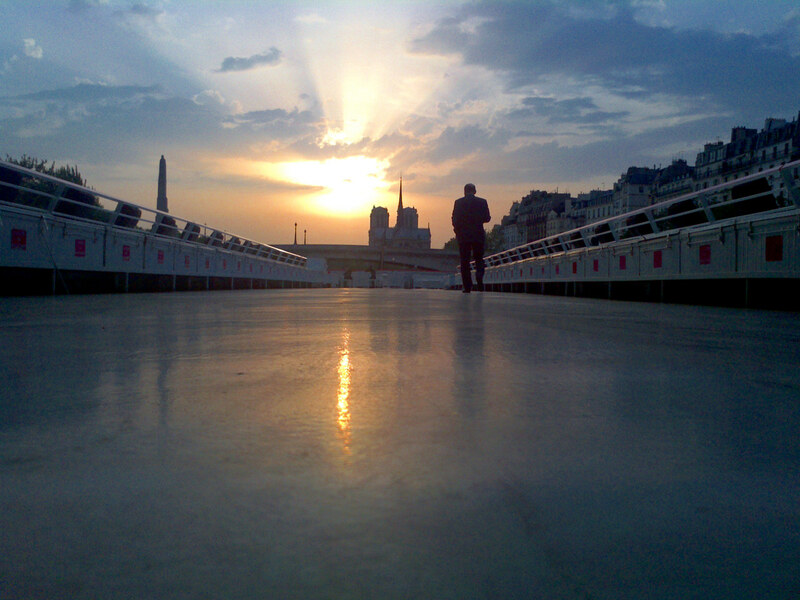 Only on a ship filled with CG people you hear people commenting on the specularity of the Parisian scenery. To the frustration of most of the Germans on board, their national team could not win from Italy, not even when Elmar Eisemann put on his football shirt. 6 Responses to "Eurographics Symposium on Rendering: Day 2"
I enjoyed your talk and the dinner as well! I’m certainly trying to get some interesting stuff cooking so I can present it at EGSR2013! See you there!